It is really that easy! I used this software to do a painted picture of my daughter which is shown here. On the top of my long list of things to do is put together a DVD of Baby Bird’s first year and I will be using this software both in my DVD cover design and throughout the DVD. I also like that by using the paint feature, it blends the background in a little better. She was just sitting on the couch, but once it was painted the couch just became a nice backdrop. I played around with the different options to create three different textures on the same picture. 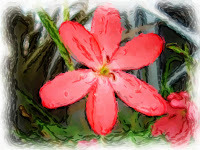 Below I took the same flower, but gave it a water brush, chalk and bristle brush look. Click on each image to zoom in and see the differences. There are so many options to what medium to choose. You can use various thick paint, thin paint, water colors, pencils and pens and dry media such as charcoal, chalk and crayon to name a few. You can also do smudging and add different effects. 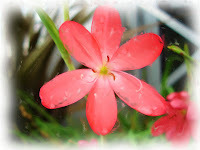 The tutorial was very easy to follow and Corel also has a lot of help pages on their site. I use a Mac computer, and Corel is available to both PC and Mac users. Corel Painter Essentials 4 retails for $99.99US but you can try a free download before buying. I am the family historian and have many pictures that are over 100 years old. I would love to have some of them "brought back to life. I would like to redo some very old pictures of my grandparents, when they immigrated to Canada. I have a very special one that says it all. I'd want to spiff up my wedding photo. We used a Polaroid camera for the one and only photo (we were young…and broke). I would love to use it with a picture of my nieces. I don't see them very often so I would sure put this to good use. I love to take pictures, so this would be ideal to liven them up a bit! If I had to pick I have a photo of my beloved dog who passed away after 17years and would love to do something really different with his photo so I could enlarge it and frame. I have a picture of my daughter who is a figure skater doing a beautiful layback spin. Only problem is she has her face all wrinkled up from the effort. I would love to remove the wrinkles and do the spin justice. I have a pic of one of my 2-year-old girls feeding her twin sister a spoon of gelato. My husband took the pic at an artistic angle and, although it is already cute as is, I can see that it has potential to be even more interesting. I would change up so many pictures it would be nuts. I would love to see what I could do with my sons grad pics. Can't pick just one picture, i would use it for all of them!!! Oh I have a great picture of my two girls that would be perfect for that application. I have a few special pics, but I have one photo of my eldest daughter that was taken when she was modeling in NY (she was 12) and I'd love to be able to play with it! Sounds like something I would use a lot! I love what you did with your photos! I would love to use this program for particularly a photo of my little guy playing in his jumparoo. So cute! Oh, I would LOVE to win this! I have a great pic of Chicken on the beach that I would want to use the program for. It's of him playing and it's so cute it's digusting! !